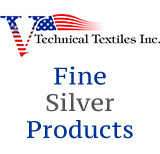 Silver Plated Nylon 66 Yarn 235/34 dtex 4 ply High Conductive Twisted Yarn with anti-tarnish coating. Purpose: Anti-microbial applications for garments, smart textiles, and sewing thread. Approx. One Pound Cone.